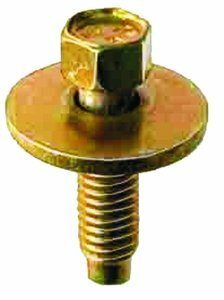 This is an M6-1.0mm x 22.5mm (7/8") bolt with a captive washer. It has a zinc and dichromate finish giving it a yellow color when new. Fastenal has it as their #11120206.